Finally I’m able to find a recipe (worth, at least) and the time to update my blog (at the end it made me find a job, so how can I neglect it????)! Mix everything together and let it rest in the fridge for few hours before to serve it. 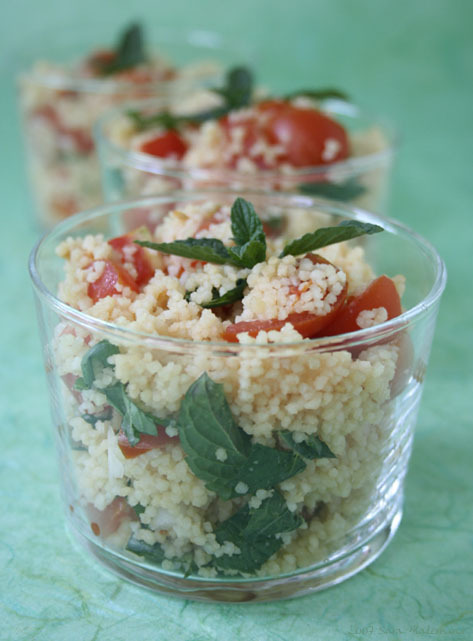 I hate to tell you, but that is not tabbouleh. Tabbouleh is a salad comprised primarily of parsley, and should be completely green in color, with only a hint of bulgur (not couscous). So, couscous-tomato salad or pilaf would be a better name. So good to have you cooking and posting again, Sara! I love the idea of serving food in verrines. Very beautiful! Let’s say, and I think I can, that this is the recipe for MY VERSION of tabouleth… Can I? I am sure that you can. Just call it Sara’s Tabouleth 🙂 I’ve never had the dish before but have heard of it. Any hew, your tabouleth sounds like a nice light, flavourful dish. Thanks for sharing.